When does FREE mean free? At Glennie’s! 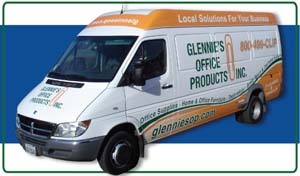 We promise free delivery of your office products order to your business address with no minimums to most communities in North San Diego and Southwest Riverside Counties*. That’s right, NO MINIMUMS. If you need something to tide you over till your next big orders, we are here for you. Order by 4:00 p.m. and your order is processed the same day. * We generally don’t like asterisks but the qualifications are: Have a current open account with Glennie’s and a business delivery address. Some exceptions do apply like orders to residential addresses and furniture deliveries which may have delivery and/or assembly charges. Check with your Account Executive or Customer Care Team for details. San Diego County communities served regularly: Escondido, San Marcos, Vista, Carlsbad, Oceanside, Camp Pendleton, Encinitas, Leucadia, Del Mar, Solana Beach, La Jolla, San Diego, La Mesa, Lakeside, Poway, Rancho Bernardo, Valley Center, Pala, Pauma Valley, Rainbow, Bonsall, Fallbrook. Nationally: We can also ship nationally to serve other locations in your organization, check with your account executive for more information about this service.